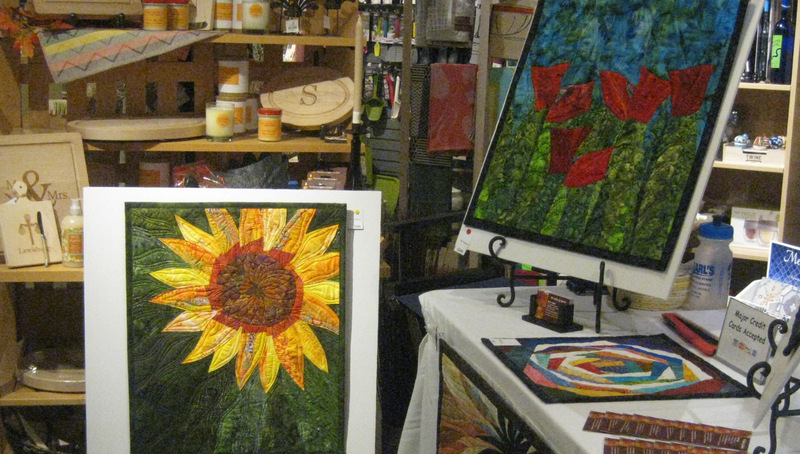 Last Friday was the annual Lewisburg Arts Council Stroll Through the Arts. 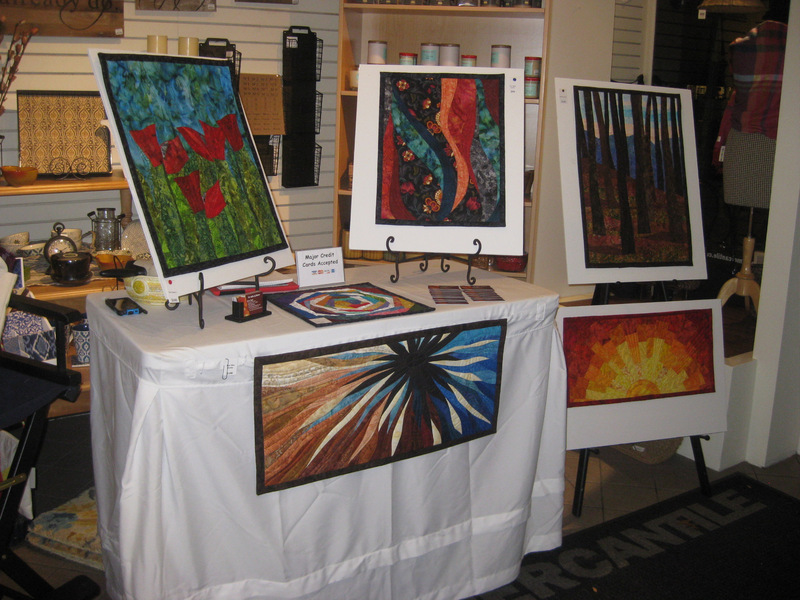 My location inside the Mercantile store, one of the best gift/home/kitchen stores in town, is just perfect for this event. 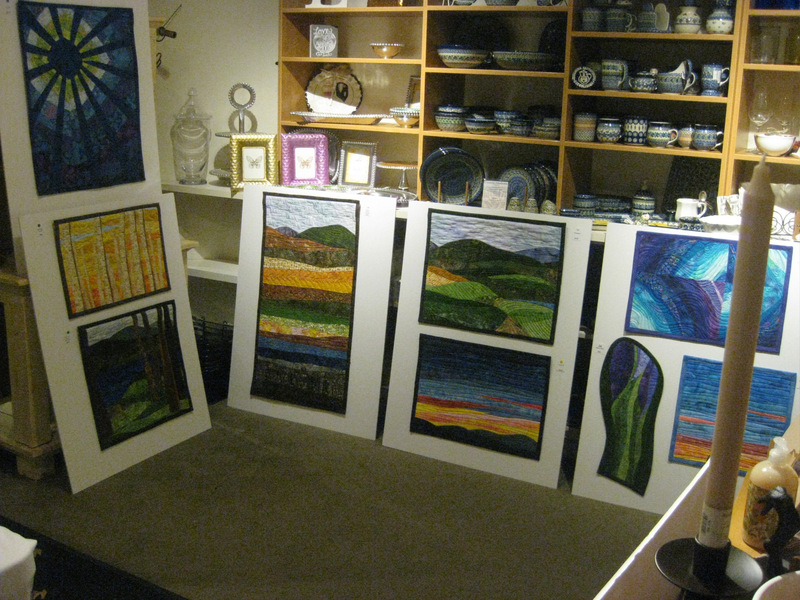 I must schlep a lot of white boards in on which to display my quilts, but the store owner and I are in our third year so we know what works. The owner and employees are very accommodating and even cleared off a display cabinet for me this year. This merchant is one of the most popular in Lewisburg so the foot traffic is great! This evening event, from 6pm – 10pm, is significantly impacted by weather. We lucked out last Friday with showers all day and then clearing by sundown. It was low 60’s/high 50’s, no wind, no rain….perfect evening strolling weather. 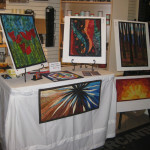 The event is advertised as an opportunity to meet and speak with local artists. 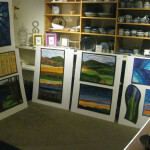 We are allowed to sell our art but the emphasis is on looking and talking. I was happy to sell one of my newest quilts, Red Poppies 2, but mostly I enjoyed the feedback and questions I received about my quilts, technique, inspiration, and designs. 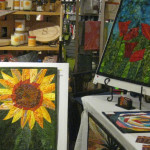 I strategically placed my new Wonky Sunflower quilt so it was visible through the door as people walked by or entered. It was a good lure inside! After an evening like this I can speak with confidence about which quilts are most interesting to people and which didn’t get much attention! This is important information as I move into some primary sewing months in the winter. I consider this one of the least expensive (FREE!) marketing activities I do each year and lots of fun too.